We've got Greg Zeschuk & Ray Muzyka, lords of Bioware, giving a talk. We've got Tim Schafer (and I think Caroline Esmurdoc, though she's not on the program yet), lord (and lady) of Doublefine, giving a talk. We've got Don Daglow, lord of Stormfront, giving a talk. And I'll be talking, too, on scheduling videogame development, and how it can't be done but you should do it anyway. One of my favorite topics. Skill game: suppose you take away all the trappings from an FPS - you have one gun with unlimited ammo and you never get to change. Still, at its core, you've got an aiming game, something which a player can become skilled at. You take away all the different moves and blocks from a fighting game, and you've got a button masher - who can hit the button the fastest? Easier to make terrain matter in an FPS: cover's important in an FPS. It's hard to make terrain matter in melee combat. Usually terrain is just annoying, and brawlers tend to place the action in open arenas free from obstructions. Ammo: once you do bring the multiple weapons into an FPS, they typically have ammo. With the exception of Deus Ex 2, where they made the risky move of giving you universal ammo, and games where they just leave too much ammo lying around, this automatically forces the player to try all the weapons, whether they're correctly balanced with each other or not. Compare with the moves from a fighting game - players very quickly find a favorite move, and tend not to try new moves, even though they may be bottom feeding (they could do a lot more damage against particular enemy X if they'd just experiment). These problems are solvable and maybe the visceral thrill of melee combat, that being-in-somebody's-face-and-hitting-them-with-something-heavy, make it worth it, but I do wonder if a game in the God of War camp will ever be able to really compete with a game in the Halo camp. For my 4th of July, I took a break from making games to...make a game. Like my last free offering, this game has been playtested exactly once. (Well, twice, if you count me playing it by myself before I sicced it on my unsuspecting wife.) (Actually, playtested twice now. -7/7/07) The verdict was: "It's cute." Sofi's just getting old enough to play with normal-sized legos now, so as I brought out my old collection of castle legos I thought, "I bet you could make a fun wargame that used these guys." I had this thought once before and don't remember the game that resulted out of it but it wasn't fun. This time I did some research first, because nowadays if you have an idea like this chances are somebody else did too and already published it on the internet for free. And there is, in fact, a ton, the pinnacle of which seems to be BrikWars by Mike Rayhawk. But BrikWars isn't quite what I'm looking for. 1) It was designed for large-scale battles. I own a total of 14 minifigs, and I'm not about to buy more. If I wanted to buy more miniatures, I'd buy tiny ones. They're cheaper. 2) I want to play it with Cathy, who has very little tolerance for grognardia. Mike Rayhawk jokes that a single turn of BrikWars can last a long time and often a game will stall out in the first turn. "QuikWars", (see chapter 2 of the BrikWars core rules) is much closer to what I'm looking for, here, but even a five-on-five battle will go too slow for her - I know. 3) Critical hits. Minifigures are perfect for some kind of critical hit system. Their hands, heads, and legs come off, after all. The critical hit system from BrikWars is: when a minifig dies, take off some limbs. But Mike Rayhawk says, hey, it's Lego, change it all you want. So I did. And here's Jamie's BrikWars Mod. If anybody actually plays this, or a variant of this, please let me know. It would make my day. And send me the variant. This game is in no way endorsed by or affiliated with Lego or any of the other companies that make interlocking plastic brick toys. Although this game ended up fairly different in mechanics from BrikWars, it's worth skimming the BrikWars rules (particularly the introductions, the bit about 'fudging', and "QuikWars") just to sort of get the feel for what I'm trying to do here. I want the same spirit of mayhem, and the point is more, "Now that we've built some stuff with our legos let's find a cool way to destroy it," than to be an actual strategy game with...strategy...and realism...and meaningful decisions. - a handful of plastic brick minifigs with removable body parts, ideally medieval-themed. I used 12; 10-18 should play great; 20-26 should play well; 28 or more probably untenable. - a handful of small plastic brick plates, half of one color, half of another. 3x4 is ideal (since a minifig can stand in the center of one) but I don't have any of those, myself, and make do with a hodgepodge. - a handful of six-sided dice, one of which you're willing to deface. - a deck of blank cards. Business cards work great. You'll need to do this once and theoretically never again. Deface sides 3-6 of the die by marking each one as one of the four different colors you have on the aforementioned small plastic bricks. Leave 1 and 2 unmarked. This is the "Who Moves?" die. Dismembered, Left Hand Remove minifig hand. 2 Dismembers = Dead. (Reshuffle)"
Dismembered, Right Hand. Remove minifig hand. 2 Dismembers = Dead. (Reshuffle)"
Dismembered, Left Leg. Remove minifig leg. 2 Dismembers = Dead. (Reshuffle) Move 1". Unmount. Dismembered, Right Leg. Remove minifig leg. 2 Dismembers = Dead. (Reshuffle) Move 1". Unmount. Headgear Backwards. Takes 1 action to straighten, or fight blind: -1 die to attack and defense. Fumble. You'll need to do this every time. Lay out some terrain, ideally with plenty of walls and structures to block line-of-sight and movement. Take all the adornments (weapons, shields, armor, etc) off your minifigs. Divide them evenly between the players. Choose one minifig on each side to be the Hero - you'll be decorating that one in a more "bad-assed" way than the others. Take all the adornments, put them in a pile, and take turns choosing one for your squad. Once you're out of adornments or you don't want any more, stop, and outfit your squads with what you've got. What the adornments actually do comes later, but I tried to keep them somewhat balanced, so if you just go for looks more power to you. There are "team colors" (the colors of the bases, which side you're on) and "unit colors" (who moves more-or-less together, the colors of the bricks you decorate the bases with). Each player puts their minifigs on bases of their color. Each player puts some kind of ostentatious decoration on their hero's base. (Like a flag with a pennant or something.) And, the important step: each player puts a block indicating what color unit each minifig, other than the hero, is in. If you only have five minifigs on each side, it's trivial. The hero gets his ostentatious direction and everyone else gets a different color. Once you have more than five, you have to start grouping guys, and you'll probably want (but don't have to) have likeminded guys in the same group. I've got 8 minifigs. 1 hero, 2 archers, 2 swordsmen, 2 axemen, and a crossbowman. I put them all on grey bases because I'm team grey. Then I put yellow 1x1 blocks on the archers' base, blue 1x1 blocks on the swordsmen base, red 1x1 blocks on the axemen base, and a black 1x1 block on the lone crossbowman's base. During the game, if I roll "yellow" on the "Who Moves?" die, my archers will go; if I roll blue the swordsmen, etc. The way we did it was just to say "You put your guys anywhere you want on your half of the table, I'll put my guys anywhere I want on my half of the table." Depending on how grognardy your opponent is, this may not work. You may have to take turns or something. Whoever's played the game before (or at least read the rules, if nobody's played) goes first. Rolling the "Who Moves?" die. If you roll a color, you get to move and act with each minifig in the unit of that color, and your hero. If you roll a 1, you get to move any 1 minifig of your choice, and your hero. If you roll a 2, you get to move any 2 minifigs of your choice, and your hero. [Designer note: Wargames tend to be boring, because one player moves all their units and then the other player moves all of theirs while the first player goes to the bathroom, gets a snack, checks their e-mail, etc. You can patch it by having some kind of system for which units go when, like initiative from d20 or the action phases of Champions / Car Wars / Star Fleet Battles but that's ponderous. (Phases are *really, really* ponderous.) One of the brilliant things about Battlelore, et al, was they just let it be (mostly) random which unit(s) get to go on each turn. Short turns, no overhead, the expected results balance out more-or-less the same, and it "feels right", like some of the chaos of war has been captured. So this is a nod to Battlelore (actually, so many nods to Battlelore in this game I could have almost called it Bricklelore), and also to Obstgarden (my daughter's favorite boardgame) where which fruit you pick is determined by the roll of a colored die. I would have used the Obstgarden die instead of marking one up but we didn't have enough tiny green legos. A minifig can move up to 5", just like in QuikWars. Convenient side note: an index card just happens to be 5" long, and folding one in half makes a good ruler. But with our second playtest we played on a hex-map (with lego walls) and found that just went quicker. A stunned/fallen minifig cannot move, but they can act. You can also trade a weapon, shield, or helmet with an ally. Counts as an action for one, free for the other. A stunned unit may come out of stun. And nothing else that turn. If, for whatever reason, your helmet's on backwards, you can straighten it. And do nothing else that turn. You may want to choose to fight blind, instead, at a one die penalty. If the minifig is within 1" of a bleeding comrade they may tend to their wounds and prevent their imminent demise. A minifig may jump over an adjacent wall that is up to chest-high. Here's where I put the obligatory "What if my minifig wants to do this weird thing" section. I don't know, figure it out amongst yourselves. A minifig with a melee weapon (sword, axe) can make a melee attack on another minifig that it can touch with its melee weapon, just like QuikWars. How Many Dice Do I Get To Roll? If the minifig is a Hero, he gets a bonus attack die. If the minifig is mounted, he gets a bonus attack die. What Does The Roll Mean? Any die that gets a 4, 5, or 6 is a "Hit." Any die that gets a 1 is a "Fumble" - the attacking minifig borked. [DN: That means a hero is not just more likely to hit than a regular guy, he's also more likely to fumble. A bunch of Inspector Clouseaus, these guys are. Can The Target Do Anything To Defend Themselves? Glad you asked. Yes - if the target is wearing armor, helmet, or shield, or is a Hero, they get defense dice. They get 1 die for an armor, 1 die for a helmet, 1 die for a shield, and an additional bonus die if they're a Hero. If the attacker gets a hit, they can roll these dice to try to negate it. Any 5 or 6 is a block - 1 less "Hit" occurs. What does a "Hit" mean? A minifig can continue to function with a dismembered limb. (Obligatory Holy Grail joke here.) Once they get two dismembers, they're dead. [That's from Greg Costikyan and Paranoia. No hit points, just Normal -> Wounded -> Dead. And convenient, because now we don't have to make crawling rules for legless minifigs.] Take the minifig off its base, remove the base from the playing field (but leave the minifig there! That's good carnage! ), and give the attacking player a victory point. What does a "Fumble" mean? A "Fumble" means you draw a card from the critical hit deck, and if the text of the card says "Fumble" in it, you apply it to the fumbling minifig. If the text doesn't say "fumble", you ignore it. Fred rolls yellow on the "Who Moves?" die. 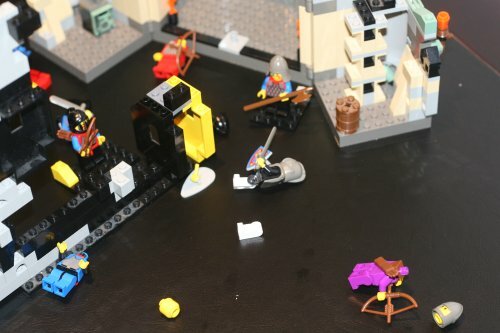 His archer is the only minifig marked with a yellow block, so he gets to move that and his hero. The archer is 20" away from the nearest enemy, so all he can do is move 5" closer to the action. His hero, on the other hand, is in the thick of things; he moves up to an enemy and attacks. His hero is holding a pole arm. It's a 2-handed weapon. Three dice, plus one for the hero = 4. He rolls 4, 5, 6, and 1: three hits and a fumble. His target says, "Well, I better try to defend myself." His target is wearing an armor breast plate, shield, and helmet, but is not a hero. Total of three dice: 5, 4, 1. One block, two ntohings. (When defending, 1's aren't fumbles.) Which means two hits get through. The hero player draws two critical hit cards, and gets: "dismember left" and "bleeding". That's the target's shield hand - the player removes the hand, shield still in it, and drops it from a height above the target minifig. It bounces a few inches away. Then they roll a six-sided die and discover the target has three turns to live if the target player doesn't do something about it. On the bright side, he's not stunned, so he will be able to act the next time he's up on the "Who Moves?" die. The hero player than draws the hero's fumble and gets "disarmed right". "Disarmed Right" is indeed a fumble so the hero cannot ignore it - he drops the polearm. The polearm skitters off about a foot - it's going to take a couple turns for the hero to run to re-arm himself! Maybe he should grab that shield that just fell in front of them instead? (If only it was the sword!) Meaningful decisions like this are the essence of good gameplay! If your character is mounted, they can move 10" instead of 5", and they get a bonus die to attack with. If, when attacking or fumbling, the card says "Unmount", they fall off the horse. If stunned, they must first take an action to come out of the stun before taking the action to re-mount the horse. If not stunned, they land on their feet. Anybody can mount either team's unmounted horses. The horses don't care. When attacking a mounted unit, you always target the guy on the horse, never the horse, you sicko. Yeah, right. Cathy'll go for that. The first player who kills more than half of the enemy units wins. Skirmish at the ruined temple of Potter ended in a lot of dismemberments. For 'bleeding', I like to make a stack of alternate colored 1x1 cylinders, one for each round until your demise. Remove a cylinder at the end of your turn, until you have one of your other minifigs stabilize your bleeder. You'll always have at least one round in which to stabilize a bleeder. Q. Can I use a two-handed weapon if I've lost a hand? A. No...but you could trade it with another friendly. Q. Can I put a sword in each hand and get two attacks? A. Only if you have the "Two Weapons" feat. Rim shot. No, that's crazy talk. But having a sword in both hands might be worth doing anyway - if you drop the first one you can always start using the second one. Q. Is a bow-and-arrow one or two-handed? Q. Can I throw a spear? A. Ok. Although a spear (one-handed) would be a 2-die weapon for a melee attack, you can also throw it as a 1-die weapon. Makes spears better than swords in game terms, which bothers me a little. So...you can throw swords, too. How about that. Drama! Q. I have a crossbow decoration. Can I have a special rule for it? Since dismemberment turned out to be 90% of the fun of this game I guess it's not a game I'll be playing with Sofi anytime soon. So, hmm, no mounted combat or vehicle rules. (Ok, there are now. 7/7/07) This is mostly because Sofi took all my lego horses and hid them somewhere in her bedroom and now I can't find them. But the ones in QuikWars are good and should require little adaptation to bring over, if I ever find the horses. If you actually read all the way to this sentence, you're crazy man. I love you. Better men than me have already discussed non-generational GC with XNA Xbox, and a few things you can do to deal with it. Trying to build upon their work - your best buddy is going to be the CLRProfiler. Once you figure out how to use it, it's an awesome tool that tells you what's allocating the most garbage, when and where. Once you've found trouble spots, there's a variety of things you can do. Using structs instead of classes is often what you want - structs are put on the stack; and an array of structs is just one object. If there are moments in your game where pauses make sense, (when the user hits the pause button, for example - or in a turn-based game, the beginning of every turn, maybe?) - that's a good time to force a garbage collection. Earlier I said we're using fixed pools. Not anymore. What we've done is, we've written our own SpecialNew and SpecialDelete functions for some of our problem classes. Delete doesn't delete; it just puts the object at the front of a linked list. Thus, the object never gets collected. New first checks that linked list to see if an old object is available, clears it out and hands it back, only actually calling the C# new if no object is available. Voila, no garbage collection, and no fixed-pool restrictions on number of objects allocated. It seems so simple once you've seen it, I don't know why I didn't think of it; it was one of our other programmers who showed me the light. One problem with it (and fixed-pools) is suddenly you lose the advantage of a constructor that is guaranteed to set your object to a known initialized state. Just like with C++, if you forget to initialize a variable in your SpecialNew...then that object's behavior is undefined. We get around this with reflection. We don't actually reflect through every object when it's SpecialNewed to initialize everything...that would probably be too slow - what we do, is in our debug builds, we reflect through the object to make sure it matches a canonical initialized object that was newed the regular way, and fire an assertion if it doesn't. This has caught a handful of omissions. One might ask: why use C# to make our game if one of the most useful features of C#, the garbage collection, shouldn't be used on the Xbox? Well, in C++, if you forget to delete an object when it goes out of scope, you've got a memory leak that will eventually crash your game. With C# on the Xbox, you do the same thing, you've got a memory "leak" that will eventually cause a garbage collection and make your game drop a frame and maybe have a noticeable hitch. I'll take the latter. It allows you to fix on an as-needed basis: you can play fast-and-loose with the heap for your early product development, and then fix your problem classes as needed. As for delegates and closures: I love, love, love delegates and it's the main reason I like working with C#. If I found out I shouldn't use them on the Xbox I would go into a Black Hole of Despair. That said, you do have to massage them sometimes. A closure, obviously, will put an object on the heap every time it's created. So if you, say, create a closure and pass it to a function for every entity every frame, that's probably going to create too much garbage. Sigh. A not-so-obvious case is if you pass a member function to a delegate parameter, that member function gets...wrapped...somehow...(I really need to look deeper into it, there are some websites that discuss it in high detail)...and so it puts garbage on the heap also. Here you can protect yourself by creating a static delegate variable and assigning the member function to it...that way the wrap only happens once and never gets collected. Still, I'm happy to play fast-and-loose with delegates and closures and then fix them once I discover the problem cases. Brief plug - I'll be speaking at the next GameFest about this stuff and more! Is There A Reference For Why Structures Better Than Parallel Arrays? Anybody got something for me?